Description: The 32-minute trio of pieces recycled from incidental music for a 1909 play by Eugène Brieux “Faith” is such a rarity that the last recording of it predates our stewardship of Records International. So some of you may not have it. Set in the Middle Kingdom of ancient Egypt, the commission gave Saint-Saëns the opportunity to use some of the Egyptian scales and popular tunes he had collected during his many travels to that country. It can be compared to the music he created for Samson et Delila in its exotic scales, a bit of mesmeric repetition and extremes of tempo and dynamics. 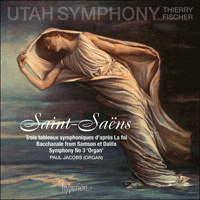 Paul Jacobs (organ), Utah Symphony; Thierry Fischer.